Home > Gear > What is the Best Immersion Blender Under $50 for Delicious Soups and Sauces? What is the Best Immersion Blender Under $50 for Delicious Soups and Sauces? When you or one of your loved ones needs to eat a pureed diet, it’s easy to feel overwhelmed by the thought of having to create a balanced, complete, and filling diet using only pureed ingredients. 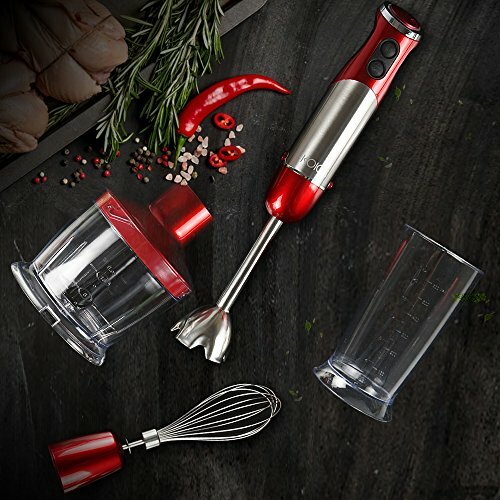 The great news is that you can adapt many of your favorite flavors and ingredients to fit a pureed diet using one simple kitchen gadget: the immersion blender. These small, but powerful tools will help you create tasty, customized pureed meals for your loved one or yourself, and take a huge weight off your shoulders. You should look for a high-powered immersion blender that comes with variable speed settings, so that you can choose how smooth or chunky you want your recipes to come out. Some immersion blenders come with a set of accessories, such as a beaker or a whisk, which will make pureeing your food much easier. You should also look for an ergonomic handle, which will ensure your comfort while you are cooking, and make it harder for the blender to slip from your hand. This blender has a rating of 4.7 stars out of 5 and over 940 reviews. 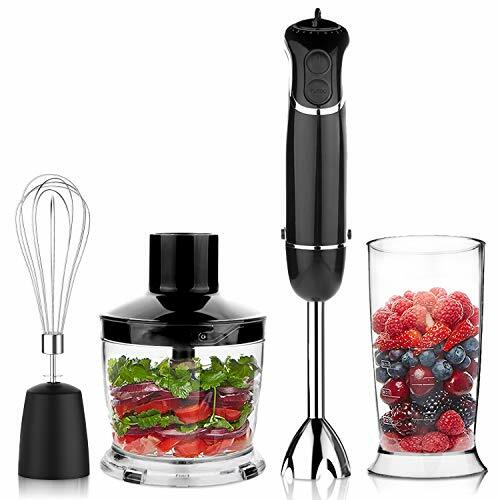 In addition to the blender, you’ll get a whisk attachment, a 600 ml beaker, a 500 ml chopper, and a cookbook. The handle is ergonomic and soft to the touch to maximize comfort, and you can adjust the speed depending on your preferences. Its 500-watt motor makes it a powerhouse that will blend your food in no time while making little noise, and all the attachments are BPA-free and dishwasher safe! Lots of reviews praise this blender for its sturdy build, handy attachments, and easy-to-use speed dial and buttons. 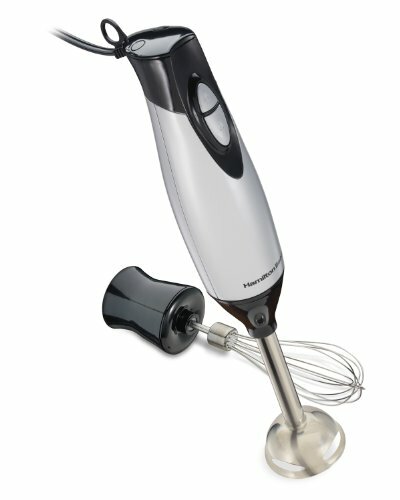 This immersion blender has a 225-Watt motor and comes with a whisk attachment. It is ergonomic and has an easy-grip texture to make sure it doesn’t slip out of your hand while using it. All the attachments are dishwasher safe. While this blender doesn’t come with many accessories or a beaker, it’s hard to beat the price. It has a rating of 4.3 starts out of 5 and over 270 customer reviews. Many of its reviews remark how durable it is, its stainless steel attachments, and how lightweight yet sturdy it is. Users have found it’s easy to use and makes an array of recipes, from smoothies to mayonnaise. This is another great option if you don’t want to break the bank. 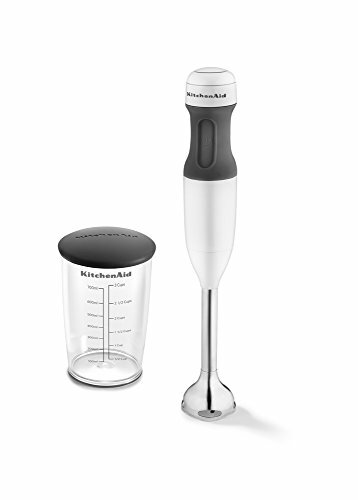 Made by the prestigious brand KitchenAid, this 2-speed immersion blender comes with a BPA-free cup complete with a lid, perfect for making your pureed meals and taking them on the go or storing them for later. It has a 216-watt motor. Its sleek design has a no-slip handle, and comes in an wide array of colors from elegant white to bright tangerine orange (price might vary depending on the color). It has amassed over 1,000 reviews with an average of 4.3 stars out of 5. While it doesn’t come with any interchangeable attachments, it will get the job done and you can always count on KitchenAid to make great, durable products. Reviewers agree that it’s well made and great for a variety of recipes including sauces, soups, and smoothies. This immersion blender has a 300-watt motor and comes with a whisker attachment, a 500 ml mini processor bowl, and a 600 ml beaker. It has 6 speeds and a turbo button, which will be perfect to customize your recipes and create different textures. It has a sleek design and a rubberized handle for secure gripping. All the attachments are dishwasher safe and BPA-free. This blender has over 2,500 reviews on Amazon with an average of 4.6 stars out of five. 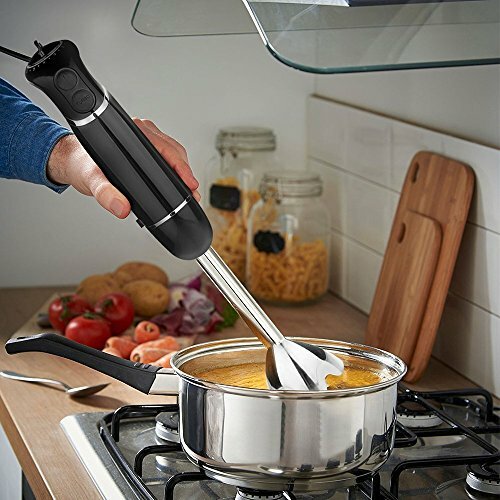 Most reviews say that the attachments are easy to clean and useful to create many recipes using only one tool, while also appreciating its power and durability. All the immersion blenders on this list are great quality and have been shown to work well and are very durable. 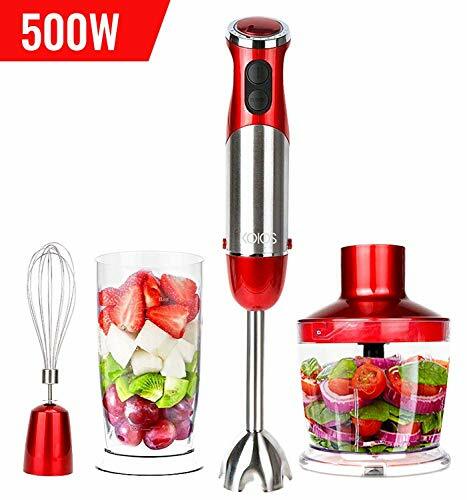 My personal choice would probably be the OXA 4-in-1 immersion blender , since it comes with many handy attachments and it has a large number of reviews which attest to its amazing quality. It’s very likely that this is the best immersion blender under $50 on Amazon. However, any of these blenders will be incredibly useful when it comes to making sure that your pureed diet is nutritious, varied, and filling! You can check out a few more options in this guide.